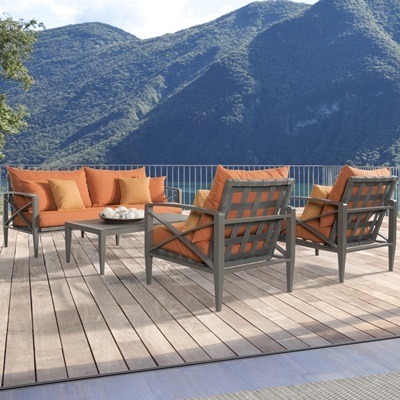 Transform your outdoor space into a contemporary retreat with The Knoxville Collection. 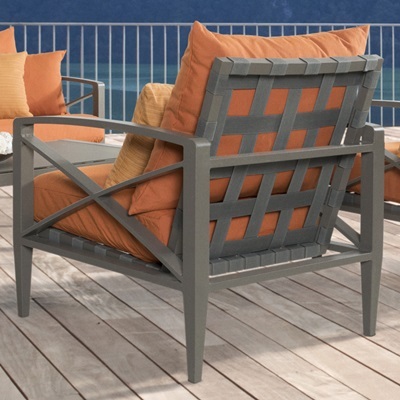 With a modern and exclusive design, the Knoxville pieces feature durable fabric straps that cross the back of the frame for a clean, linear aesthetic to distinguish your taste. 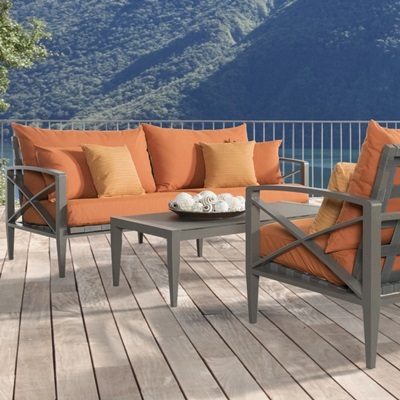 Pieces are smartly proportioned and built with durable materials that withstand the elements, allowing you to relax and settle in for a leisurely outdoor experience. Plush 5-inch thick, high density, quick drying cushions are featured in Tikka Orange with coordinated accent toss pillows. QUALITY: Materials are engineered to withstand the elements, while providing a firm base. STYLE: Durable fabric straps cross the back of the frame for a linear aesthetic. CUSHIONS Plush cushions are layered to allow moisture to completely drain, and is wrapped in Sunbrella® fabric to last for years.